On April 11th, 2013 Greenwich High School, in Greenwich, CT, entered a lockdown after a couple of students called the police to report that a student might be armed and was entering the campus. The dispatch immediately relayed information to the principal who initiated the lockdown procedure. The SWAT team was called and responded very quickly. They arrived on the scene and promptly located the student in his classroom. Then, 5 officers entered with weapons drawn and apprehended him. A student who was located on the same hallway as the suspect during the lockdown estimated it took the police slightly over 10 minutes to enter the room from the time the lockdown started. The police report (pasted in the bottom of the post) states that the student (suspect) was not in possession of a weapon and that a further search of his home didn’t produce any evidence. It goes on to state that the student was charged with breach of peace despite having no evidence to support the arrest. This event brought to light several glaring problems with the lockdown procedure in general that I feel should be brought to the national conversation. First, it seems that all it takes to ruin someone’s reputation is to call in a false weapons threat. So if you dislike someone at school, you can simply call the police and report that you heard them talking about shooting someone. From the police report: “Interviews with the witnesses revealed that the suspect, a student of GHS, made a comment to two other students where he intimated that he possessed a firearm in his book bag. That he planned to use the firearm to shoot people in another state.” So he “intimated” that he was going to shoot someone in another state? That doesn’t sound like an immediate threat to me. Second, the suspect was apprehended when 5 SWAT officers entered the classroom with assault rifles drawn. If the student was armed, they would have opened fire and killed not only him, but everyone around him. Third, the lockdown, once initiated locks the students inside the classroom. This is fine as long as your classroom has no windows and the attacker is outside. But what this event helps us realize is that each of the students are the potential attackers and they are being locked inside the classroom with a room full of unarmed victims. In addition, since the students are there during the lockdown drills they know exactly what happens during a lockdown. A potential killer would need only wait till his biggest class of the day and then call in a threat against himself. Once the lockdown begins he could have free reign of the room and then actually escape by taking the teacher’s key. Fourth, in discussing this with Marchand, In Context’s military affairs commentator, he immediately recognized that the lockdown essentially hands a terrorist a room full of hostages that could be used for negotiating purposes. All of these factors combine to create a situation for maximum casualties, quite the opposite of the intent. Parents are often comforted by the thought that the government is “doing something” in response to a problem, but nobody actually thinks critically about whether or not it’s a good idea or even addresses the issues at hand. Almost all mass killings have been perpetrated by people on anti-depressant SSRI medications that cause psychotic breaks as a side effect, yet almost nobody talks about this because our own schools and doctors are pushing these drugs which make billions of dollars for big pharma and create dependent customers for life. The lockdown procedure is about as effective to stopping mass killings as duck and cover was for protecting yourself against nuclear blasts. People just seem to need to be comforted by the psychological effect of doing something, regardless of efficacy. The police simply should have addressed the issue with appropriate reaction and instead of letting a suspect know that his cover is blown, approach him quietly and de-escalate the situation. Several armed officers should have gone to the classroom and had a teacher pull the student out of class for a discussion. A quick search of his bag and locker would show that he was just blowing smoke and they could talk some sense into him and find out why he was angry at these other people. Psychology shows us that violence is most often a reaction of our desire to be heard. People who act out are expressing themselves in the only way they know how. This was no excuse to traumatize students and parents and further erode individual liberties by falsely arresting someone based on rumor and innuendo. The icing on the cake is that the GPD charged the student with breach of peace even though they found no evidence. It was as if they needed to justify their over-reaction. People who support the lockdown procedure think that containing and isolating the threat is a good idea, unless of course it’s them, their spouse or their kid locked in the room and chalked up as “acceptable losses”. I do not think that the death of any person is an acceptable loss for the greater good of the whole, and I don’t think anyone would sign the waiver stating as such. But if Greenwich High School or any other school is going to implement the lockdown as standard protocol, I think that is exactly what is called for. An acknowledgement by parents stating they understand their kids might be locked in the room with a potential killer. I for one won’t sign. 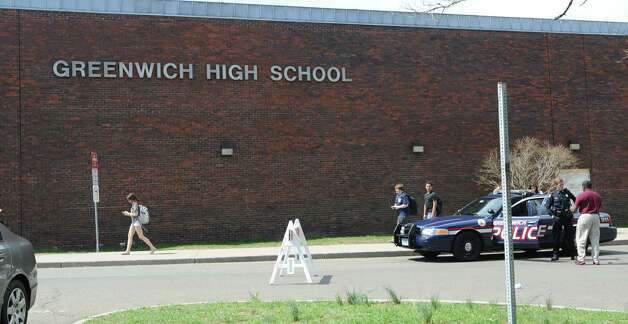 Greenwich, CT: At approximately 10:43 hours April 11, 2013 the Greenwich Police Department (GPD)E911 dispatch center received a call from a Greenwich High School(GHS)student who was reporting that there was a male student armed with a gun walking into the building. The GHS administration was notified of the report and they initiated their Lockdown protocols as the Greenwich Police, including the GPD School Resource Officer (SRO), responded. The suspect was quickly located and detained at gunpoint by the SRO and responding officers. The suspect was highly cooperative and it was determined that the suspect was NOT in possession of a weapon. No one was injured during the incident. Interviews with the witnesses revealed that the suspect, a student of GHS, made a comment to two other students where he intimated that he possessed a firearm in his book bag. That he planned to use the firearm to shoot people in another state. These students became alarmed that the suspect had a gun in school. The alarmed students then consulted with two more GHS students who then initiated the call to the dispatch center. Detectives continued the investigation off campus, searching his residence with the consent of his mother. The search resulted in no weapons found. The suspect, Gianfranco Romero DOB 06/10/1993 (19 yoa) of 168 North Water Street, Greenwich, CT has been summoned to appear at Stamford Superior Court on 4/19/2013 to answer to the charge Breach of Peace 53a- 181. This entry was posted in police state, Propaganda, terrorism and tagged GPD, greenwich high school, school lockdown. Bookmark the permalink.